Do you have pets? Are they important in your life? 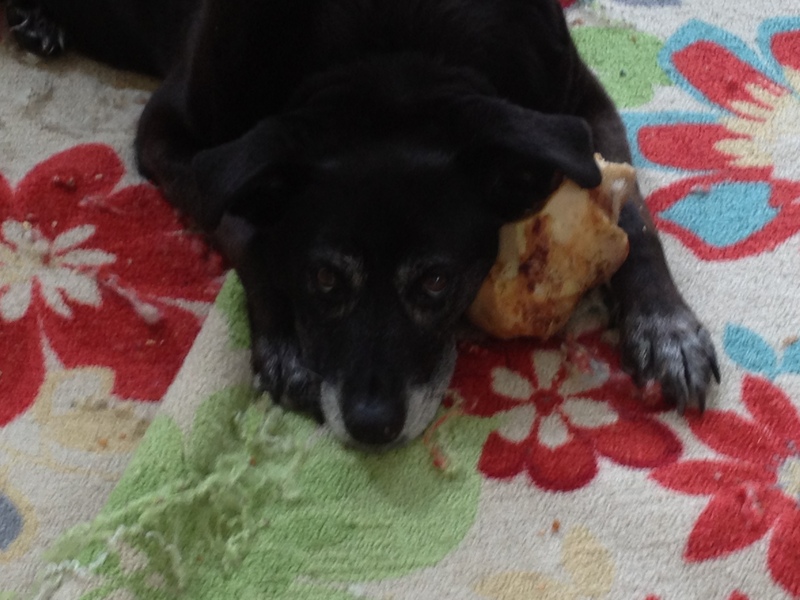 Natalie, my wonder rescue dog in the photo above (with her favorite bone, of course) has been my constant companion for the last 10 years. She’s getting up in years now, but is still my shadow almost everywhere we go. She is very protective of us and our kids, and though she is a marshmallow at heart, she will make it clear that all unknown people and squirrels had better stay clear of her people. I’m thinking that by starting with pets, we have something that is highly interesting, focused, and concrete to use as our things to describe before we launch into family as a whole–which can get a little messy. Pets only come in a few colors, with a few places they can live, and a limited range of descriptors…but people bring more options! My hope is that by doing this we will be able to work on descriptions and topics like adjective agreement in a way that makes sense to the students before turning them loose on families. ¿Sacas muchas fotografías? ¿Sacas fotos de animales? ¿Sacas muchos “selfies”? ¿Tienes animales en casa? ¿Cuántos animales tienes? ¿Quieres animales? ¿Cuántos animales quieres? ¿Tienes un perro? ¿Quieres un perro? ¿Comes helado? ¿Cuál helado es tu favorito? We used Martina Bex’s listening/drawing dictation forms as I read three key sentences from the story to students. Drawing inspiration from this post, I narrated a slide show of 10 common pets in the US… and then talked about some common pets in other countries. They will never look at guinea pigs the same way again! I love this aspect of bringing in culture to this topic. Fast Five activity: After modeling the question/answer sequence of “do you have”/”Yes, I have…/No, I don’t have…”, each student interviewed five other students about whether or not they had several of the pets we had discussed. They took notes on the answers (aka collected data!) they received. After brief modeling of the words pero and también in sentences, students wrote a 3-5 sentence summary of the results of their surveys. We worked with Sie7e’s awesome song called Tengo tu amor with activities from the amazing Zachary Jones. This song has 20+ repetitions of tengo/tiene and is a class favorite from last year. Tomorrow we will start describing our pets’ coloring, place of residence, size, and name. For students who don’t have a pet, I ask them to pick one that they had in the past, or they can temporarily “adopt” one from a friend or family member. If they still can’t choose one, they can describe a stuffed animal that they have/had. Students will write a brief description of their pet and submit it for editing and feedback. We will read an infographic about pet ownership & expenses. I can’t find the original, but it was in the NY Times and I translated it to Spanish. Later in the week we will read another brief passage about pet ownership in other countries for comparison. We will watch and enjoy 🙂 the Pollito Pío video. This is a keeper! Students are engaged, and are quickly absorbing some key skills that will be necessary for future units. The cultural aspects are also very interesting to many students. Want more ideas for using animals/pets in class? Check out this collection from Zachary Jones.